There is a lot of talk about how great Hairfinity is lately and people all over the world, celebrities too, have hopped on the Hairfinity bandwagon. This really peaked my interest and so I did my research and begun to think about buying a bottle to try it out. Once I checked the price, I began to have second thoughts about this product. No, they aren’t super expensive but for $24 per bottle is going to be a bit pricey for those who are on a budget and who wants to take them daily for more than 30 days. Once you add in the shipping it is around $30 per bottle. Biotin is part of the B Vitamin family. It helps to break your food down and helps with absorbing fatty acids and more. It also helps to promote cellular growth, so people use it to help grow their hair, nails and make their skin better. You can get biotin from quantities of vitamins in our foods that we eat and from the microorganisms that live in our intestines that make Biotin. You will normally take in between 40 to 60 mcg of Biotin each day from food. Although, it is recommended that you take between 1,000 to 2,000 mcg of Biotin to treat hair loss. The main ingredient in Hairfinity is Biotin. It also contains Vitamin D, Vitamin A, and Vitamin C, but you can get those from multivitamins. Hairfinity claims that it can grow your hair ¾ inch to 1 inch every month. Most hair will grow ½ inch every month. Hairfinity contains MSM. The sulfur in MSM is needed for healthy keratin and collagen, which are needed for healthy hair growth. You can purchase MSM for a lot cheaper. The added expense of Hairfinity does lose out to Biotin or a Hair, Skin, and Nail multivitamin. You can avoid the cost if you do not mind a lower dose. Most multivitamins that we use will contain biotin. 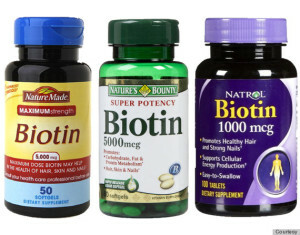 There isn’t really a worry about the amounts of biotin because your body will flush out the vitamins that are not used. For instance, Hairfinity contains over 800% of your daily amount for Biotin, and if your body doesn’t need it all, it will flush out in your urine. So, taking a lower dosage of biotin, your hair will actually become stronger and thicker in a month. There are some side effects of taking high doses of Biotin and Hairfinity. You can have increased hair shedding and breakout in acne. 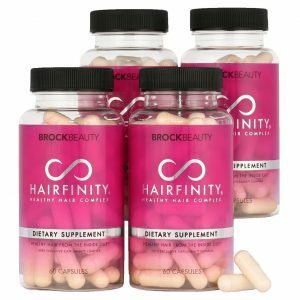 If you choose to take either Biotin or Hairfinity it is highly recommended that you increase your water intake to 200 ounces daily to help with the side effects. In the end, it is up to you if you believe that Hairfinity is better and you can afford $30 per bottle, or if you would rather go a less expensive route with the Biotin and multivitamin combo.